At least 92 people sustained severe eye injuries during the recent spate of clashes between protesters and armed forces. Pellet guns, which were introduced by the state police in 2010 as a “non-lethal weapon” to quell protests in Kashmir, have inflicted grievous injuries on civilians. During the 2010 summer uprising, number of pellet-injured people admitted to state-run SMHS hospital in Srinagar alone, was close to 40. In 2013, an RTI filed by advocate Abdul Manan Bukhari revealed that 91 patients with pellet gun injuries were admitted in the hospital from March 2010 to October 2013. Out of the 91 patients, 36 were admitted in the Department of Ophthalmology and 14 pellet-injured people had no chance of regaining their eyesight. In the last 16 months, 32 eye surgeries were performed on patients hit by pellets. 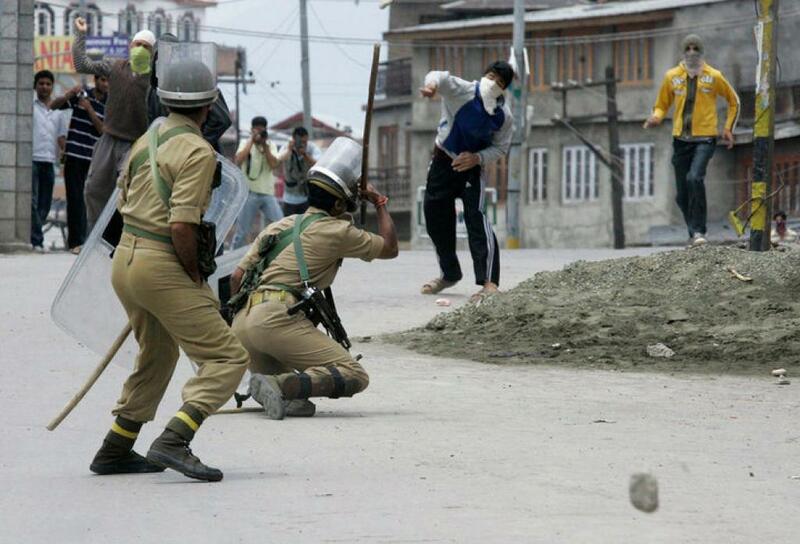 In Sher-I-Kashmir Institute of Medical Sciences (SKIMS), 100 people with pellet injuries were admitted from 2010-2011. In 2013, 18 people were admitted for the treatment of their pellet injuries. Few days back, Sajad Khanday, consultant ophthalmologist at SMHS, had told media, “Pellets can cause corneal abrasion, lens dislocation, retinal tear and cataract. Their eyesight is badly affected or even permanently gone. It invariably damages all the components of the eyes.” Explaining the seriousness of the injury, he said that the eye doesn’t retain its normal size and its shape gets distorted inside out. It has also come to pass that injured civilians avoid visiting hospitals in fear of being arrested and booked by the police. Most of them prefer being treated outside the state, especially in Delhi. Hence, the data received from state hospitals doesn’t always reveal the actual number of victims. Contesting the process adopted by state police and paramilitary forces of using firearms to quell protests, Bukhari says Basic Principles on the use of force and firearms clearly disallow the use of force in dispersing non-violent and unlawful assemblies. He also said that as per Section 129 of the Code of Criminal Procedure (CrPC) of the Indian constitution, armed forces have to disperse the mob with maximum restraint. Are pellet guns really non-lethal? What are non-lethal weapons? Globally, they are defined as weapons “which are explicitly designed and developed to incapacitate or repel personnel, with a low probability of fatality or permanent injury, or to disable equipment, with minimal undesired damage or impact on the environment”. In case of pellet guns, the clause “low probability of fatality or permanent injury” doesn’t hold true because they inflict permanent injuries and deaths in some cases. “How can pellets be non-lethal? When fired from a short range, they make deep perforations in a body and render people maimed, permanently. I have treated patients with injuries in their ears and limbs. Be it rubber bullets of pellets, the injuries are fatal, ” Bashir Ahmad Mir, Department of Orthopedics, Government Medical College, Srinagar, told Down To Earth. The pellet guns, which are used by the J&K Police and the CRPF, are manufactured by Indian Ordnance Factory Ammunition Factory in Pune. The shots are usually made of lead-based alloy and travel at subsonic speed when fired from gun. The alloy proves detrimental as it inflicts multiple-organ injuries. At one shot, a pellet gun fires numerous pellets at multiple targets, hence increasing the risk of multiple injuries. Moreover, the pattern of firing by the armed forces does not meet the UN standards. Pellet guns are supposed to be fired from some distance but people are losing their eyesight as these guns are being used from a very close range. In his book, “Kashmir—Scars of Pellet Gun”, Bukhari has argued that using pellet guns to disburse protesters is alien in civilised societies of the world and its use on unarmed civilian populations is generally considered a transgression of human rights. He also noted that this “non-lethal” weapon is exclusively used in Kashmir and have never been used in other parts of the country. He has also accused the police and CRPF personnel of targeting vital parts of civilian protesters. On being questioned why is the government oblivious to the cost of treatment that the families of injured civilians have to incur, she says, “Today, CM saheba instructed me to collect the data of number of people with pellet injuries in SKIMS and SHMS. Even if they had to be shifted to other states for treatment, the government will make all the arrangements.” Naqash is the first minister from the PDP-BJP coalition government who sought ban on the use of pellet guns. There was a drama when taser guns were being introduced. What do you people want?